A landscape of shell holes, burnt plane carcasses, and terminals nearly razed to the ground. Drone footage has revealed the devastation at Donetsk International Airport, following months of fighting between the Ukrainian military and local militia. The drone footage was uploaded online by Army SOS, a volunteer organization which provides support to the Ukrainian army. 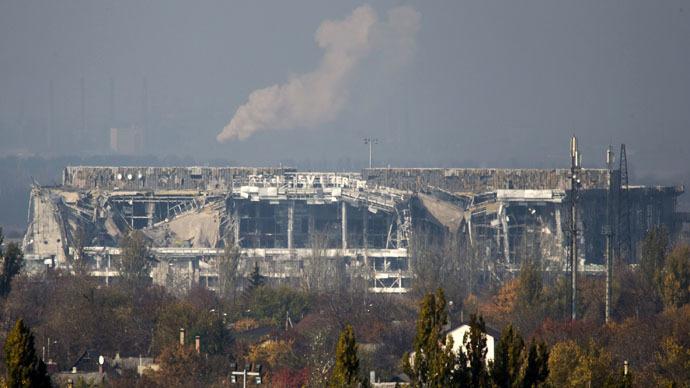 On Sunday, fighting at the strategic Donetsk airport. “...Self-defense forces successfully repelled all six attacks by Ukrainian armored vehicle columns, performed with massive artillery support,” Aleksandr Zakharchenko, head of the Donetsk People’s Republic, said. Rebels claim they established full control of the Donetsk airport on Friday as they dislodged Ukrainian troops from the new terminal. The venue saw large-scale battles from May to late September, leading to the deaths of over 70 people. As a result, the international airport – which used to handle some five million passengers annually – is now lying in ruins.